Nitin Jain, CEO of Global Asset & Wealth Management at Edelweiss Group. Mumbai: Edelweiss Alternative Asset Advisors Ltd, the alternative asset management arm of Edelweiss Group, on Tuesday said it plans to raise ₹ 2,000 crore for a fund called EISAF II Onshore Fund that would invest in distressed assets. This includes a minimum amount of ₹ 1,000 crore and a greenshoe option to keep another ₹ 1,000 crore of inflows. 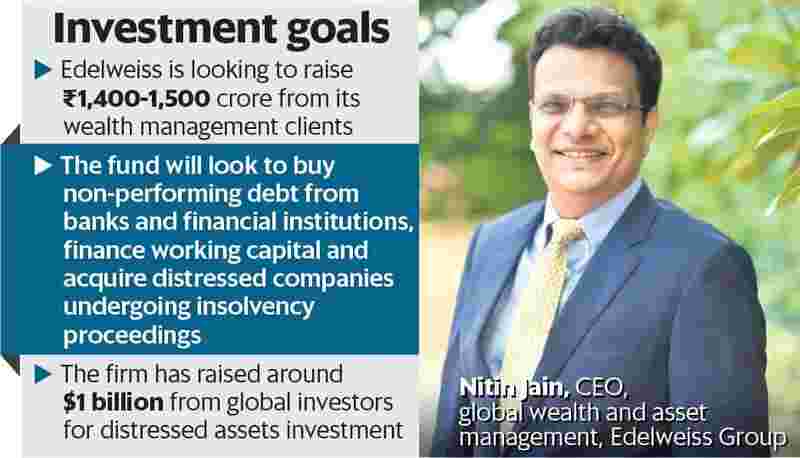 “The fund’s investment mandate is centered around acquisition of non-performing debt from banks or financial institutions, funding companies for debt settlements, working capital financing and acquisition of stressed companies (debt & equity) under insolvency proceedings under the National Company Law Tribunal (NCLT)," Nitin Jain, chief executive officer, Global Wealth and Asset Management, Edelweiss Group said in a statement. The Edelweiss Group currently has approximately ₹ 1.63 trillion of assets under management across various funds. It recently raised ₹ 2,000 crore for an infrastructure-focused fund called Edelweiss Infrastructure Yield Plus. The distressed assets fund strategy at Edelweiss is headed by Amit Agarwal. The new fund’s strategy is similar to Edelweiss’s previous distressed assets fund that the firm is raising from global investors, said Jain, adding the firm decided to launch a separate fund for India after receiving strong interest from domestic investors. “We were earlier raising the money for this strategy only globally. We have raised $950 million globally and we will do a final close of that fund by August or September. But a lot of our wealth clients came back and asked to be allowed to participate in the same strategy. So we created a slice of that and we are raising exclusively $200-250 million (₹1,400-1,500 crore) of that only from our wealth clients," said Jain. Jain added that domestic investors have become more sophisticated in the last three-four years and that is driving the demand for unique strategies such as distressed assets and other yield products. “Indian investors have become very sophisticated and the general awareness has gone up substantially. Also, fixed income alternatives are very few now. Most options give you 7.5-8%. So, either you go to equity which is volatile, and you have macro and global issues. If you are looking to invest for the long term and looking for steadier but higher than fixed income returns, then these products become very interesting," he said. The product’s market-neutral nature is also an attractive attribute for investors, said Jain. “This has also created an interesting opportunity for investors to participate in market-neutral strategy, which offers equity-like upside with a lot of protection on the downside. It is not very affected by how the equity markets will do, it will not be very affected by where the interest rates will be three years down the line. This fits very well in most portfolios of sophisticated investors and family offices," he said. As part of its strategy, the fund will look largely at working with existing managements to effect turn around of stressed companies. “We don’t like to take complete control. We like to work with existing managements in most cases. But we augment the management. So, we do take control of cash flows, in terms of monitoring of cash flows, purchase and sales. In select cases, we might augment it further with external consultants, our own turnaround team," said Jain. However, he added that in certain situations, the fund may take total control of assets. Apart from distressed assets funds, Edelweiss also has a major presence in the stressed assets resolution space through its asset reconstruction company (ARC) business. Ten-year-old Edelweiss Asset Reconstruction Company is India’s largest ARC with an AUM of over ₹ 44,100 crore.